ho could fail to be charmed by the story of a detective whose assistant is a baby elephant? 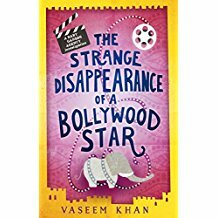 In this third novel by Vaseem Khan featuring Inspector Chopra and his elephant Ganesha there is a delightful lightness of touch and deft humour as this somewhat unlikely pair go about their lives in modern day Mumbai. Baby Ganesha is clearly the star of the book, despite its setting in the star laden Bollywood film industry, and he is described variously as trumpeting in delight or alarm, bugling, snorting, sniffing, trotting, bundling, pacing, shuffling, forlorn, stomping in a tantrum, and even, somewhat surreally, riding in a specially reinforced motorbike sidecar. Elephants are of course well-known for their intelligence and their memories, but here Ganesha uses his trunk to find clues, can track people by smell, charges into undesirable ne’er-do-wells and acts as a distraction for the activities of his guardian, Inspector Chopra. Appropriately, when all is resolved, he is rewarded with a starring film role to complement his starring role in this book. The other characters in the drama – and it is difficult not to think of them as side characters – are Inspector Chopra, a retired Indian police inspector now working as a private detective, his assistant Sub-Inspector Rangwalla, Chopra’s wife Poppy and her unhelpful mother, and the urchin Irfan whom they have rescued from the Mumbai slums. The plot centres on the disappearance of an unlamented film star diva and his fierce mother and there are many twists before the final outcome is revealed. It is clear that Vikram [aka Vicky] Verma has been kidnapped, but by whom and for what purpose are the questions Chopra must unravel and it is indeed a knotted story: just as one set of suspects are followed then discarded, another come into focus, fade into innocence and are replaced by yet more. There is some exposition of the Indian film industry and of the corruption apparently inherent in many of the Indian institutions with which Inspector Chopra has to deal, including an appalling incident of false imprisonment which is the one dark episode in the book’s narrative. Chopra is described repeatedly as a man of honour and integrity and is clearly a fond creation of the author. He is indeed a likeable man with an equally likeable wife which gives a pleasant thread of humanity to the book. It is a safe read for those who prefer their crime cosier than brutal. Slightly oddly, but intriguingly, there is a totally disconnected sub plot with Sub-Inspector Rangwalla, a retired police officer who has joined Chopra in his private detective work. This story takes him into the lives of eunuchs in Mumbai who are derided by society and forced to live in defensive communities together. I found it notable that the eunuchs are always described in feminine grammar – “she, her” - when in common parlance they are perhaps thought of more often as men-in-drag or the infamous “lady boys”. The plight of the eunuchs as social outcasts is evidently close to the author’s heart as it is described with compassion and a degree of outrage. This theme culminates in an explicit plea that these members of society should no longer be viewed as the kind of pariahs as those known as “Untouchable” used to be and can be accepted in other professions than those into which they are driven by necessity. The author’s descriptions of Mumbai and Indian life are delineated from an outsider’s point of view which makes them more easily accessible to those who have not seen the country nor have no special knowledge of it. The book is written with great humour, relish and perhaps a tongue-in-cheek anthropomorphism of the elephant hero. I hope baby Ganesha does not become too big for the small van in which Inspector Chopra drives them both around, for I am hoping for many more outings for them both before he moves on to more mature duties.